Models made from PLA are made of thermoplastic. PLA is a good choice for both design products and for functional products. PLA models are not extremely accurate and have a medium level of print detail. You do have a lot of freedom in the design of the model. However, the quality of the surface of the models is coarser than other materials. The biggest advantage of using PLA is its chemical composition. This thermoplastic is made of corn starch and is fully biodegradable and will not have an environmental impact. The disadvantage of using this material is that sometimes it gently twists during printing and in models of larger dimensions may cause small deformations (millimeters). The price of 3D printing with PLA depends of the time it takes to print and also on the size of the object. The price is about 200 Kč per hour of printing. 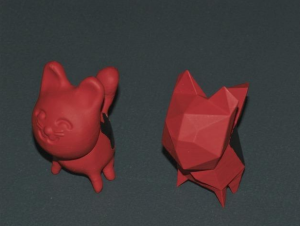 For example, the red cat shown below (around 5 cm tall and each layer is 200 microns) prints in about an hour. However, if printed with layers of 100 microns, it will take about two hours to print. In the table below, you can get an idea of how the layer size affects print time. Let us give you a quote for a model you would like printed. Send a 3D model in *.STL format to info@makerslab.cz and we will give you an estimate of the price. You can also find us on 3D Hubs, where you can simply upload your 3D model in *.STL format to immediately receive a quote for your model. 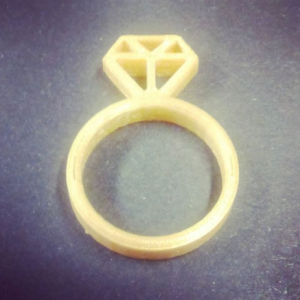 The principle of the 3D printing technology of Fused Deposition Modeling (FDM) is simple. It is similar to using a hot glue gun. The material is heated until medlted and then forced through a fine nozzle at the end of the glue gun. The difference is that the “flue” that is inserted into the printer is a long plastic wire called a filament. The nozzle of the printer moves and draws a pattern with the material layer by layer. When a model contains overhands, the printer builds support so that you can print in “thin air”. The supporting material must be removed when the print is finished.